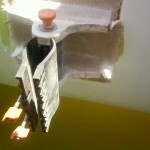 Balsa core flanges glass-epoxied to float. 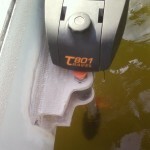 Here’s how I’ve mounted the little Torqeedo to the starboard float. The swivel bracket is taken from a spare bracket that Claude gave me. (Misadventure I think is the polite way of saying he dropped one in the drink.) Its takes a bit of tinkering and some suitable epithets to undo it from the balsa core flanges – but it can be done. So only the edges of the flanges will be presented to the waves when sailing fast. 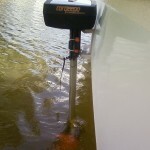 When coming into a marina that has restricted manouvring room I can attach this quick-release swivel bracket, and then slide the Torqeedo into it. Here’s how it looks attached. The motor and shaft is attached first, and then the battery added. So each item is quite light and easily handled – which should be handy on those days when the sea is sloppy. With this additional thrust well offset from the main motor I’m hoping for a strong skid steering effect. The little Torqeedo has the same prop (more or less) as the big one and so even though its a much smaller motor, its thrust should still be good, especially as it only has to turn the boat. I’m looking forward to testing it soon. Brackets still need fairing and painting. I need to get about 5m of telephone cable to allow the throttle control to be positioned in the cockpit. It may feel a bit odd because the throttle for the main motor is a fore-and-aft lever and for the 801 is a twist grip. I can charge the battery using its standard mains charger by plugging it into my 300 watt inverter which handles it ok. So even though its a roundabout path the energy sill comes from the sun. The next day (11 Dec) I continued with the discharge test and ran the motor from 5.30am at around 1000 to 1500 watts until after about 4 hours the low voltage alarm sounded. The cell with low voltage is not the same one that gave trouble before. 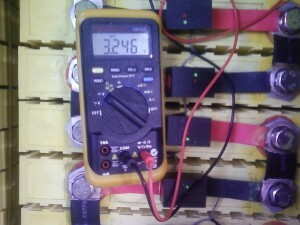 The low voltage showed up at a draw-down of 130 ah, which is 70 ah short of full capacity. I know that this cell was not brought up to full voltage at the last recharge. Only two cells got to full voltage and in my impatience to test the pack, I didn’t wait until all the cells protectors went red. This result just confirms that the pack is unbalanced due to me leaving the cell protectors on some cells, and not on others, while I was in the boatyard. (There is small current needed by the cell protectors and so they slowly drain the cell when left connected.) So I need to recharge the pack and make sure it is properly balanced by having all cells at full voltage. For a few days I recharged the pack using sunshine, and then on 15 Dec borrowed a 48v charger from Claude Desjardins and pumped in about 70 ah until one the cells reached full voltage. This 240v charger puts in 15a and this is way too much for the cell protectors to dissipate so I now have to continue the charging using solar. The solar charger runs at between 1 and 2 amps depending on the state of charge of the house batteries (which it feeds off), and even this is a bit high for the cell protectors so it needs watching. I also have an “automatic” dc-dc charger which I cobbled together using a voltage sensitive switch and a dc-dc converter. This also runs at 1 to 2 amps but is intermittent. Switching on and off according to the house battery voltage. The intermittence is just about right to give a nice trickle charge that the cell protectors can shunt. This morning there are still only two cells that have reached full voltage and the pack has just about recovered the amphours used by the drawdown test. As the day goes on I hope to see more cells ‘in the red’. P.S. I updated the history page with some photos. This is voltage after about 50% drawdown. I gradually increased the power to 4500 watts and at all times the pack voltage and individual cell voltages stayed high. No sagging under load. So the problem was indeed a poor interconnection. At 4500 watts though I got a ‘thermometer’ icon on the Torqeedo and it automatically reduced power to 4000 watts. I manually reduced it back to 2500 watts shortly after. And soon the temperature warning disappeared. Today I’m running the motor some more and at this moment the drawdown is 101 ah so the pack is about 50% discharged. The voltage is still good at 51v with a load of 1500 watts. Being on the dock, with the tide going out I’m running in reverse – in sync with the tidal flow. But its beginning to cavitate at this power so I’m not giving it more than this. All the terminals, connections and cables are cold – so there’s no high resistance ‘weak links’ this time.